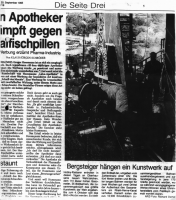 In autumn 1995, I took part in mounting what was then the largest artwork that had ever existed. The picture was made of 10.000 (100 x 100) pieces of painted canvas, each being 1 square meter in size. The pieces were sewn together to a single piece of 10.000 square meters in size. The thing was attached to a very large building: the Gasometer Oberhausen, which used to be the largest gas storage tank in Europe. Today, it is used for art and exhibitions. I was still studying at the time, and I was thrilled to take part in the vertical adventure. It was a well-paid job, as well. I acquired the nickname "The spider" for my ability to seemlessly reach any place at the wall with ease. I also quickly acquired a leading role in the difficult craft of moving around the wall, securing the work, coordinating the handling of the large pieces in wind and weather. It was also fun when we later took the image down later. Being very fragile and susceptible to strong winds in about 100 meters height above the ground, it was quite damaged after about 6 weeks, and starting to loose shape. It was late autumn by now. The process of unmounting the picture was about a week of work, and was achieved by me and only three friends maybe. Lastly, I ended up with very sore muscles in my arms, longing for a complete rest. A short note about the picture made it onto the famous page 3 of the Sueddeutsche Zeitung. The techniques of doing roped work was not standardized at the time. We improvised everything in "alpine style". The balconies are spaced 15 meters. Sometimes we slept in old premises. Gasometer is seen in the distance. The "Centro" was built at the time.